THE CHALLENGE OF LIVING LIFE AS BOTH A BIPOLAR AND AN ALCOHOLIC.Jane S. is one of the 60-percent (or more) of "manic depressives" (persons severely bipolar) who are also alcoholics. Her bipolar life story covers forty-seven years of sobriety and forty-five years on lithium therapy, how her illnesses have interacted, and particularly how much of the shape of her life -- and her achievement of her life's goals (including, for the last forty-seven years, sobriety) -- has been shaped by her bipolarity.This book is important reading for those dealing with "manic depression," either in those close to them or in themselves, and even more for those who suffer from both of Jane's diseases. Her memories include, literally, the good (paying cash down for her first Mustang, though that was because she didn't know how to work a bank account), the bad (the sailboat she was on being boarded by the Coast Guard off Maryland), and the ugly (hearing her head being dribbled like a basketball outside her side-room in the hospital) -- and the very good, the white-light dream that began her recovery from alcoholism. She is believed to have been on lithium therapy for her condition longer than anyone else in the United States. THE CHALLENGE OF LIVING LIFE AS BOTH A BIPOLAR AND AN ALCOHOLIC. 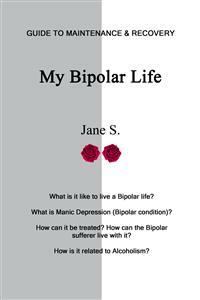 Jane S. is one of the 60-percent (or more) of "manic depressives" (persons severely bipolar) who are also alcoholics. Her bipolar life story covers forty-seven years of sobriety and forty-five years on lithium therapy, how her illnesses have interacted, and particularly how much of the shape of her life -- and her achievement of her life's goals (including, for the last forty-seven years, sobriety) -- has been shaped by her bipolarity. This book is important reading for those dealing with "manic depression," either in those close to them or in themselves, and even more for those who suffer from both of Jane's diseases. Her memories include, literally, the good (paying cash down for her first Mustang, though that was because she didn't know how to work a bank account), the bad (the sailboat she was on being boarded by the Coast Guard off Maryland), and the ugly (hearing her head being dribbled like a basketball outside her side-room in the hospital) -- and the very good, the white-light dream that began her recovery from alcoholism. She is believed to have been on lithium therapy for her condition longer than anyone else in the United States. See janesabc.wordpress.com for more information. Keep yourself like an empty vessel for God to fill. Keep pouring out yourself to help others so that God can keep filling you up with His spirit…. To be clear, a lake must have an inflow and an outflow.—Twenty-Four Hours a Day, Nov. 2nd. QUESTION 1: WHAT IS MANIC DEPRESSION? QUESTION 2: HOW CAN IT BE TREATED? QUESTION 3: VISION/DREAM? VR? CURE WITHIN? If you suffer from bipolar disorder (manic depression), or if someone you love suffers, my story may help save your life—or theirs. It wasn’t just personal stories alone that helped me—except by letting me know there were others in the same fix I was in. But personal stories with explanations and parallels drawn—they helped me understand. It’s been said that 60 percent of those with bipolar disorder may be alcoholic, and 60 percent of alcoholics may be bipolar. I’m one of the many “bipolars” with alcohol problems, and in Alcoholics Anonymous we try to tell our stories so they’ll help other alcoholics. I’ve tried to tell my story here so there are clues to successfully beating back the manic depression (and alcoholism is part of my story: that’s here too.) I hope to help everyone who is bipolar as much as I can, but I’m alcoholic and bipolar: there may be extra life-saving help here for those who are both. When I stopped drinking, and learned to keep stopped, through Alcoholics Anonymous, I thought my problems were over. They weren’t. A little over a year and a half later, I was hospitalized, as is told in “My Story,” which leads off this book, after this brief author’s word. When I was diagnosed as a manic-depressive, I had three questions I think every newly-diagnosed manic depressive has—I mean, besides the usual “Why does this have to happen to me?” They were (1) “What is manic depression [bipolar disorder]?” and (2) “What can I do about it—how is it treated?” and (3) “How can I live my life with this horrible condition?” (Some of my friends may not have asked this third question out loud, but they decided the answer was that they couldn’t. They answered the question with suicide. If you have the disease, you’ll know why.). As a manic depressive who was and is also alcoholic, I also wanted to know (4) “Is there a link between my two diseases?” I’ll tell my story, and then I’ll try to answer these questions in notes. It isn’t very exciting, but I’ll begin at the beginning—except I’ll put in three vignettes from years later. The first vignette—maybe “vision” would be a better word—is most obviously from the alcoholism part of my story, though I know now it’s from both. It was the night I stopped drinking, in October 1970. For almost the first night in years, I didn’t have a nightmare—I had what I now think of as my white dream (and I’m afraid I’m having to tell the story in the same words I use later on—it’s hard enough to find one set of words). In the dream there was a large window with no curtains and glistering white sunlight poured in that window almost as white as diamonds. I had never had a dream like that before (or since)—what was it like? Even the words I have found don’t seem to describe what happened very well. I saw the light, though I can’t really describe its appearance (even “white” isn’t quite right), and as soon as I saw it, it was like the design of things was opened to me. I sat there, all confused, and then my whole self that had been angry and “down” was suddenly “up”—like a switch from drowning to swimming. In the second vignette, maybe twenty months later, I’m in a padded side-room in the mental hospital and I’m convinced my head is detached and bouncing around the room. (I think now it was from the sounds of a volley-ball game outside, but back then it was my head and it was bouncing off the walls.) This is obviously part of the “bipolar” part of my story. The third vignette is in the same part of the bipolar story. I’m in the same (mental) hospital (my last one), beginning the lithium treatment (which had just recently been re-approved in the United States). This is only a short time after the bouncing volleyball-head. After a few days in solitary confinement I was allowed to wear real clothes and my meals were upstairs. Eventually I was allowed down the huge staircase to the dining room and after all I’d been through the dining room was like a palace and I could eat anything I wanted and even have seconds. But when they began to introduce the lithium carbonate, I did not do well. I had tremendous tremors and it was nothing for me to take a spoonful of cereal and the tremor would be so great the cereal wound up thrown across the room. I can still see that and the table I was sitting at. Then one day the nurse came up to me with a little plate of crackers covered with peanut butter. There were about half a dozen crackers on the plate—no, maybe four or five. I asked what they were for and I was told just to eat the crackers: the doctor had ordered them. After a week or two my tremors were gone and with just a few minor exceptions they have not returned. That was something more than forty years ago. So there are the parts of the “trailer” for my story. A wonderful vision, then my head as a bouncing volley-ball, and then fooling my system by putting Lithium in peanut-butter on crackers. Back to my story. I was born June 26 1941, on just about the hottest day in years, in Chestnut Hill, Philadelphia, to two intelligent loving parents. Two years later my brother was born (on a colder day, in October) and he had the same conditions I have—manic depression and alcoholism. But he developed differently. I seemed to be able to get along pretty well with my dad but the situation with my mother was crazy. I guess she had no idea how to handle me so she beat me. I got more spankings—lickings—beatings than you could shake a stick at. I had bruises, black and blue marks everywhere and I was terribly ashamed and I never told a living soul. I was afraid to tell my father for fear he would be angry with my mother so I just lived it out. My brother was very much like me but he never got a spanking. Maybe because he was asthmatic (and two years younger). I think I started yelling and screaming when I was born in the Chestnut Hill hospital—as I say, it was the hottest time of the hottest year then on record, and my grandfather had my mother and me to stay at the house on the Widener Estate, where he lived as the Superintendent of the Estate: it was cooler there with the stone house and the trees around the house. (This house comes back into the story when I didn’t even recognize it years later.) And my grandfather taught my mother how to stop my crying by holding me up with my stomach on the palm of his hand and his arm raised. It worked. The house where I spent my early days, from age four to age thirteen, was also large. It was a couple of hundred years old and had two fireplaces and seven bedrooms. I shared this house with my mother and father, my baby brother, my cousin Stephanie when she stayed with us, and our housekeeper Iva. I started very early with temper tantrums (which I was famous for in our family)and gave my mother a lot of trouble. I picked on my brother Teddy all the time, and my cousin Stephanie when she was there. The main reason I picked on Stevie was that she had cascades of curling hair and I had none (and seventy years later I still don’t have any). When I started to school I had trouble getting along with everyone, teachers and students, though I got good grades and played sports. It was when I was almost thirteen that my father died suddenly of a heart attack and I was left with my mother and brother. I went to work in my father’s greenhouses and I missed school: there wasn’t much normal in my life at thirteen. Up to that time there hadn’t been other people in my life besides family (but I had twenty first-cousins): instead of friends I had dolls. And a doll crib and a doll coach. And a large bedroom with lots of books. And, of course, dogs—and there were the horses. But no people friends. I worried about what was wrong with me and as a matter of fact I still do, though now I have a diagnosis, a condition called manic depression. Shortly after my father died, my brother was sent to the Milton Hershey School and I was left with my mother. (There wasn’t anyone else to take care of the greenhouses.) In seventh grade in the junior high school, before I quit to work in the greenhouses, I spoke when I should not have spoken to Mr. S, the art teacher, and he slapped me. I was absolutely shocked. I didn’t say anything but I was terrified. This was right after my dad died and before I started work at the greenhouses. I don’t think I went back to school. I was humiliated and I didn’t even tell my mother. I must have really tried his patience. I did talk out of turn in every class I was in—I even “spoke out” in one of Mr. Risser’s classes at the Prospectville School (he was our Principal). When I did that (this was before my dad died), Mr. Risser came over toward me and I ran out of the room and into the girls’ room. That was the day he called my father. My father told Mr. Risser, “Tell her to go home immediately.” I did and he came home and he spanked me, which was very rare. There were our family gatherings, from both families, my mother’s and my dad’s, in those days. Sometime in the summer, when we were in Prospectville, these family gatherings would have forty to fifty people. We had a large property so there was plenty of room. We had horses so that those who could ride would be able to ride. We had Blackie, the pony, and the pony cart, yellow with red trim. Blackie was very strong and very durable and he could haul twenty-five children in that pony cart—so the picnics at our house were very popular. The children loved those pony rides. Then there were Georgy David and Stumpy. They were two infant squirrels of the three we rescued when their mother had been killed (by a car or truck perhaps)—they were so young their eyes weren’t open. We put them in a shoe box in the oven, to keep them warm, and my mother called the Philadelphia Zoo to find out how to take care of them. The man at the Zoo told her it was hopeless—they wouldn’t survive—and she told him she had two children who had rescued them and put them in a shoe box in the oven to keep them warm, and she wasn’t going to tell her children that their mother couldn’t do anything. So the man at the Zoo gave her a formula recipe for feeding baby squirrels even though it wasn’t going to work and we got a doll-bottle and we nursed those baby squirrels in the dining room, and they survived, and when the man at the Zoo heard about it he said we’d done something no one else had done, at least around Philadelphia. I don’t know why we called one Georgy David, but Stumpy was called Stumpy because he had only the stump of a tail. When we let them go loose, my dad said we’d never see them again, but in the fall they came back and they hung chattering on the screen door to the kitchen, talking to my mother. Dad built a kind of shelf where there was a hole in the tree where they lived (at least I think they lived there). And we used to put food for them there. When Mother hung the laundry out to dry, they would get in the pocket, and Mother would reach in and get them out when she brought the laundry in. But a couple of years later, we were in a hurry to get to the Club so my father could get a swim in before it rained, and Mother got the laundry in and dumped it in the basket, and the squirrels suffocated before we got back. Mother was inconsolable. When I was a child, especially there in Prospectville, I was extremely active physically, with the riding and the country life: the riding was a great exercise for me. My parents bred German shepherd dogs for the United States Coast Guard “Dogs for Defense” program during the Second World War, and I guess a little after (we had them in Prospectville and we moved there in 1945). If you look up Prospectville, and try to find out what it was like from the last days of World War II, till my father’s death in 1954, you’ll find some earlier history—that it was a hamlet within Horsham Township, originally called Cashtown, at the intersection of Horsham Road [SR 463] and Limekiln Pike [SR 152], and that it includes Whitemarsh Cemetery—but you won’t find much on the years after World War II, when we lived there. You will also find some references to the Prospectville School, and you will find (after some additional research) that the oldest structure in the hamlet was built, not at the intersection of what are now 463 and 152, but on a high point a little further along Horsham Road (in the opposite direction from the Cemetery). This was a kind of tower-house (almost a blockhouse for defense), where it commanded a view of the road toward Graeme Park [the Keith mansion]: the oldest (stone) part of the house having an 1850s wooden addition. The next owners after us (the Kerpers) built onto the house and it became a general store of a kind. It’s still there, adjacent to the big Wawa on the corner, and it currently houses the office of the local state representative. As I’ve suggested, I was considered to be on the loud side, whether it was in school, or with my cousins, or later on. I always talked. I was quite often disruptive in school. With my girlfriends, with my cousins, in the family, I spoke out of turn, I bossed, I tattled—“Mommy, daddy hung his bath-towel on the floor.” Teachers didn’t discipline me as much as they could have because I was a good student. I had the sense—inside me—that I had to speak up because I knew what had to be said—and my mother tended to be that way—she was either singing or talking. I generally wasn’t singing—I couldn’t really sing. The little school at Prospectville was just down the road from our house. The school was composed of the Music room, the 1st grade room, the 2nd and 3rd grade room and the 4th, 5th, and 6th grade room; the rooms had sliding doors between them. And then downstairs was a lunch room which was also the Cub Scout room and in fact the activities room. We had visitors like state troopers, who came to visit us in that room, and sometimes they brought their dogs. My father started the lunch program through the PTA and he got the bus driver’s wife to be the cook and serve the lunches. Lunches were 25 cents apiece and if you didn’t have the 25 cents the P.T.A. paid for the lunch. Mrs. Hendry was the lunch lady; Mr. Hendry was the bus driver. I learned early in life that dogs—and especially in my childhood German Shepherd dogs—are good friends. They are affectionate and they’re always there. Horses, on the other hand, for me, don’t bring a great deal to the equation. I’ve ridden horses and enjoyed the experience, and I’ve known and had friendly horses, but there isn’t the kind of intimacy there is with a dog. Even so, I do have wonderful memories of horses, from before my father’s death, of riding with my mother and father and my brother Teddy from our house on Horsham Road over to the Keith mansion—the house they call Graeme Park. Graeme Park had been built originally about the same time as the old part of our house, in the mid-1720s, and the houses were just far enough apart and just close enough together for one to have been a kind of outpost for the other—our house for Graeme Park: it was a good ride. And then my father died. I think this was what set off my manic depression—if that’s possible. It went back to a winter day when it was early in the morning, maybe 6 o’clock: he was driving from the house in Prospectville to the greenhouses in Horsham on Witmer Road; it was a blizzard and there was a car in the ditch on the right-hand side of the road and my father got out of his car and lifted the other car out of the ditch, the front end first and then the back end. The car was driven by a registered nurse who worked at the Abington Memorial Hospital and she was on her way to work. He lifted her car back on the road and got her started and then went on his way. He told my mother later that when he lifted the woman’s car he felt a pain in his chest. He went to the greenhouses, got the men scheduled to work, and then the pain increased and he went home and lay down on the couch and the pain kept getting worse. Mother called Dr. Vollmer and he sent an ambulance out to get Daddy to the hospital and they decided he had had a massive heart attack. He was just about forty years old. That was in February—maybe January—and in April my father was dead. He never recovered from the heart attack; he was sent home from the hospital and he kept trying to get out of bed. He was never without pain and I was thinking, when I started looking at my memories, that he never left the second floor of the house. But that wasn’t true: he had one time he went to the greenhouses, and they told my mother after he died that he had been potting orchids and told them not to tell my mother. He had been a very heavy smoker and eaten a lot of pork roast and gravy—but was a very active athlete. He was also a swimmer and a diver, and played golf, and ice hockey. I remember he was always very fit—until this. Sometime after his death, when mother and Uncle Tom and the family were talking about my dad, and they couldn’t understand how he was such a terrific athlete but he died so quickly, they decided it must have been financial stress, trying to make it on his own in growing orchids and roses, separate from Uncle Bill. Later on, my Aunt Doris told me the reason my father didn’t make money was because of my mother’s wild spending—a fur coat when he should have been putting the money back in the business. And she actually had two fur coats. I guess much of it was stress. But it wasn’t just stress, I think. When my dad was born [in 1913] he was what they called a blue baby—meaning he had a bad heart. And when he was a little boy he always had something wrong. He built himself up over the years—I was told later by aunts or uncles that all he wanted to do was play football. One of his uncles [on his mother’s side] was one of the owners of the Grace Lines, and my grandfather talked Uncle Phil into having Daddy work as a stoker in the boiler room—before he went to college. He worked two years on the Grace Lines. The second year he brought home a baby ocelot that he gave to the Brooklyn zoo—he hated to part with him because he loved that ocelot and used to carry him around like a kitten but my grandmother wouldn’t have an ocelot in the house. The second year he was on the ship he hurt his leg and it was very bad; they cruised up to California to an American hospital and they were going to take his leg off. I think, looking back on it, he really didn’t have enough strength to lift that car. Fourteen years before, he had had a ruptured appendix and was in an oxygen tent and they didn’t think he was going to pull through—this was after he married my mother in 1939 and before I was born in 1941. He had a kidney condition too. But he was my daddy and I knew he was strong, and until I looked back while we were writing this I didn’t recall all the weaknesses and problems. He was always very trim. And on the morning when my brother came to my room and said “Daddy’s dying—you better come see him!” I didn’t believe him and I didn’t go right away. What happened to me when he died? You know, I was reading a memoir by C. S. Lewis the other day, and he talks about the effect of his mother’s death when he was a child: “With my mother’s death [he wrote], all settled happiness, all that was tranquil and reliable, disappeared from my life. There was to be much fun, many pleasures, many stabs of Joy; but no more of the old security. It was sea and islands now; the great continent had sunk like Atlantis.” And C. S. Lewis, so far as I know, wasn’t even a manic depressive. But he has hit it off pretty exactly here for what happened to me, when my father died. Of course, I remember the greenhouses, from before my father’s death—and after—of course, after. I remember looking at the orchids—mostly brown and green orchids—in the orchid greenhouse. I can still see them in my mind’s eye—and all the roses in the other greenhouses. My husband asked me just now if my dad had other flowers besides roses and orchids—I don’t think so—just some highly specialized orchids. I believe he and Uncle Bill developed a rose that was a predecessor to the American Beauty rose—the Better Times rose—they did it for someone else so he could take the proceeds from it. This was at the end of the Depression and before we went to Prospectville. I can see the gravel walkways, the wooden walkways, the cistern that held water for the greenhouses—it had frogs in it and my brother used to come down and get the frogs. I can look at each greenhouse in my memory—the orchid houses with the shelves for all the orchids. I can see the greenhouses for the roses—roses as high as I was—white, red, yellow, pink, and a color called talisman—like a yellow orange. White, yellow, pink, red—my dad’s favorite was a red, my mother’s was yellow, mine was pink—Teddy didn’t have a favorite that I know of—the only thing he liked about the greenhouses was the frogs from the cistern. And there was one other color I remember in thinking about the roses—but not the color of any rose. In preparing roses for market we had to cut them and sort them by size, and then we wrapped them with white wax paper. Printed on the wax paper in large letters in dark green was “Roses by Starke” [Edward P. Starke, Hatboro, Pennsylvania]. Of course the orchids were all colors and they were exquisite—they were shipped all over the world—the United States, Hawaii, Britain—Hawaii wasn’t a state then—and every greenhouse had hoses because everything had to be watered. And of course the shed was where we packed—put the orchids in glass tubes and we put the roses in white wrappers. In the center of the houses for the orchids was a potting shed where my father potted all the orchids. At that time they were potted in peat moss and osmunda fiber.